As I pull the Christmas ham out of the refrigerator my father always says the same thing–“Look at the size of that thing! Who’s going to eat it all?” I point out that leftovers are a good thing. We are all exhausted after the holidays, nobody wants to cook. That said, no matter how small a ham I buy, at the end of the evening when we’re divvying up the leftovers it starts to feels like a magician’s handkerchief–just when you think you’ve seen the last of it, there’s more. The issue is the residual ham–the stuff on the bone, the bits that didn’t carve so well–the sad ham. We’re not a family that throws perfectly good food in the trash, so someone is expected to take it, and–I don’t know–make soup–something. This year I drew the short straw. 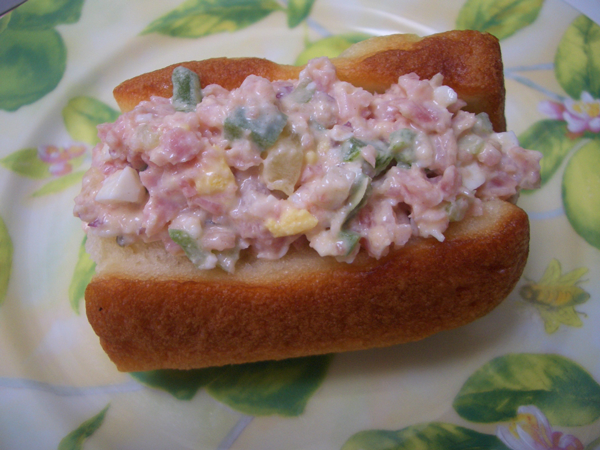 I don’t know why I thought of ham salad. I’ve never had it. But meat and veg chopped fine and held together with mayo are the cornerstone of the tea sandwich world. And as I was mulling the whole thing over, I spied the pile of Parker House rolls and the method to unload a whole lot of leftovers at once was born. Don’t add additional seasoning until you’ve tasted it. The ham will likely provide more than enough salt and pepper flavor. Mix all the ingredients until well blended. Chill for a few hours to let the flavors meld. The recipe I used for the rolls is from the Fanny Farmer Baking Book, which is out of print, but the recipe is plastered all over the Internet. Because I’m not a fan of trans fats, the one and only change I made was to use Spectrum’s organic non-hydrogenated shortening, which should be widely available. 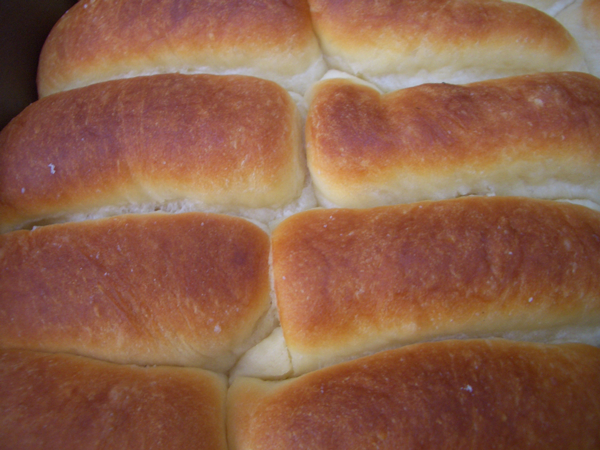 This is a super soft, slightly sweet, buttery roll. Combine the warm water with yeast and let stand for five minutes until frothy. Combine the shortening, sugar and salt in a large bowl. Warm the milk and add it to the shortening mixture. Whisk to combine. The shortening will not melt completely. 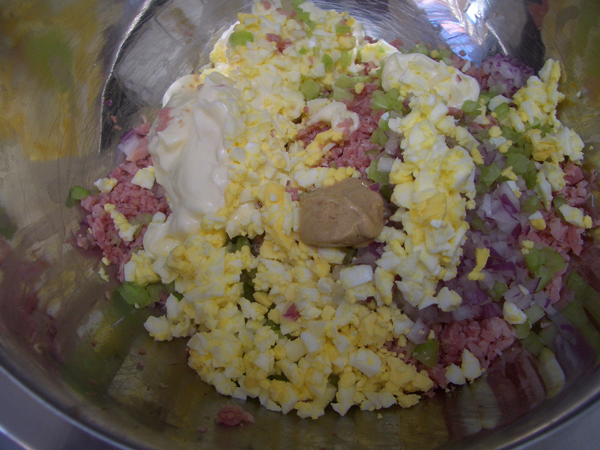 Add the yeast mixture and the egg and whisk to combine. Add the flour and stir with a wooden spoon until everything is combined and dough is formed. Transfer dough to a lightly floured surface, flour your hands and knead for about five minutes until smooth. You might need to add a little more flour, but not much. The dough will feel sticky but shouldn’t actually stick to your hands. The more flour you add the tougher your rolls will be. Transfer the dough to a lightly oiled bowl. Cover with plastic wrap or a damp towel and tuck into in a warm place until doubled in size, about 1-1/2 hours. Melt the butter and lightly brush the baking pan with it. Set aside. Punch down the dough and divide into four equal pieces. 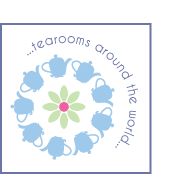 One at a time, roll each piece into a 12 x 6 inch (31 x 15cm) rectangle. Cut the rectangle lengthwise into three equal strips. Cut the strips crosswise into three. You will have nine small rectangles. You might find the dough doesn’t quite roll out to the specified dimensions, and with a smaller rectangle you get fewer pieces. That’s OK. You want the dough to roll out to about 1/4 inch (0.6cm). If you can’t get nine small rectangles, go with six. Brush the right half of each small rectangle with the melted butter. Fold the left/unbuttered half over the buttered half, overlapping by about 1/2 inch (1.3cm). 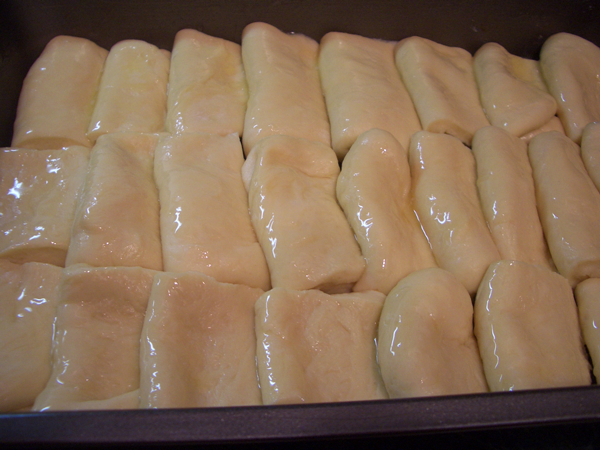 Starting from the left side of the baking pan, shingle the rolls across the pan to form one row lengthwise. Repeat with the other three portions of dough until you have 36 (or so) rolls. The dough might not make it all the way to the edges. Don’t worry about it. If you want an easier process, just divide the dough into about 32-36 small pieces, roll into balls and place side by side in the pan. Brush the rolls with the remaining melted butter and sprinkle with flake salt. If you’re making the rolls for sandwiches and the filling is well seasoned, you might want to pass on the salt. Loosely cover with plastic wrap or dish towel, and refrigerate for 30 minutes to 6 hours. 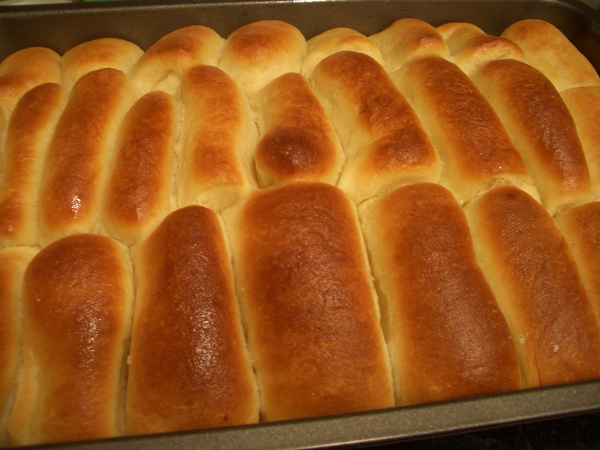 Bake rolls for 20-30 minutes, until golden brown. Serve warm. 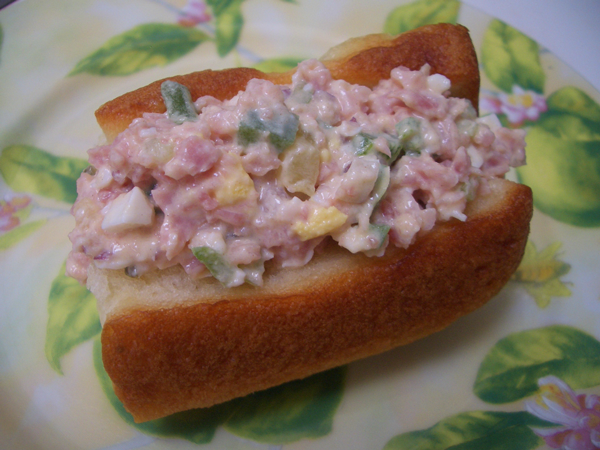 The rolls can be refrigerated and kept for about a week in the refrigerator. The shortening makes the rolls stiff when cold, so when serving, reheat in the microwave for a few seconds or wrap in foil and reheat in the oven at a low temperature until soft. Split the rolls with a knife or pull apart at the fold. 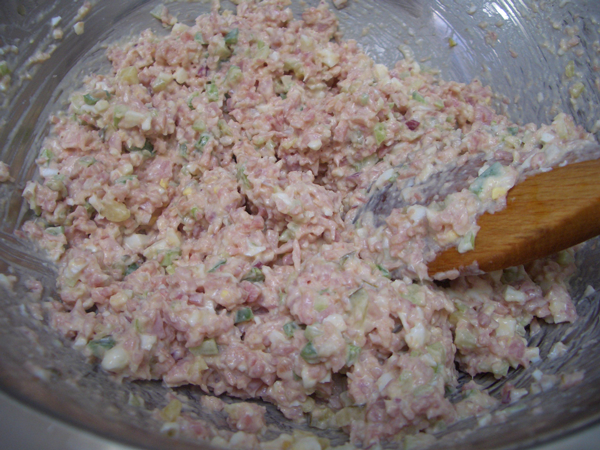 Fill with the ham salad.